The Library opened its new exhibition Women Get the Vote: A Historic Look at the Nineteenth Amendment with a festive reception on Tuesday, January 29. Head Librarian Carolyn Waters welcomed guests and Head of Exhibitions Harriet Shapiro talked about the breadth of research needed to cover the century-long struggle for women’s suffrage. Brooke Kroeger, author of The Suffragents: How Women Used Men to Get the Vote, gave engaging remarks about the suffrage movement and some of its striking personalities. She also shared with us a wonderful summary, video, and commentary about the evening, the exhibition, and the history. Speaker Brooke Kroeger (left, center); Harry and Genie Havemeyer, who loaned a beautiful “Votes for Women” sash to the exhibition, with Chair of the Board Carol Collins Malone (right). Photos by Karen Smul. 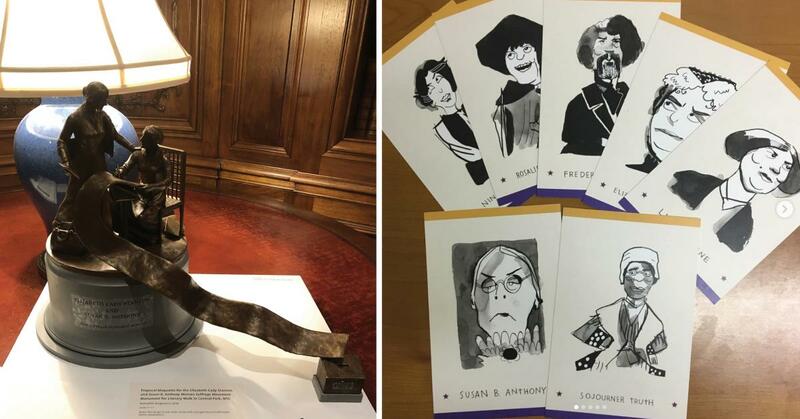 We were honored to display the proposed maquette for a statue of Elizabeth Cady Stanton and Susan B. Anthony. The life-size statue is being sculpted by Library member Meredith Bergmann and should be dedicated in Central Park in 2020. Events Assistant and professional cartoonist Katie Fricas created this original set of postcards celebrating the faces of the suffrage movement. Postcards are $1.50 apiece and available for purchase at the Circulation Desk. 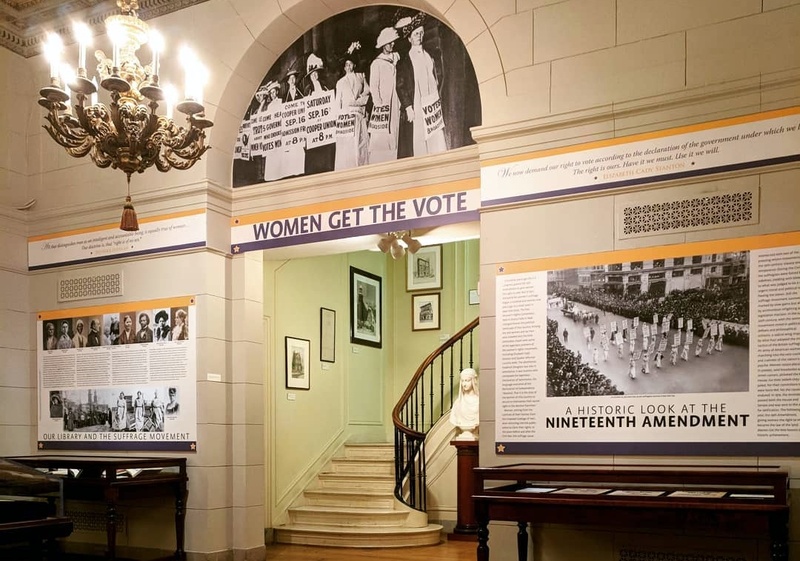 Women Get the Vote is open to the public in the Peluso Family Exhibition Gallery through August 30, 2019. Full details on the exhibition here. This exhibition is generously supported by Ada Peluso and Romano I. Peluso.